Play for Cuba is an exciting new project to ship a container of musical instruments and equipment to young musicians on the island. 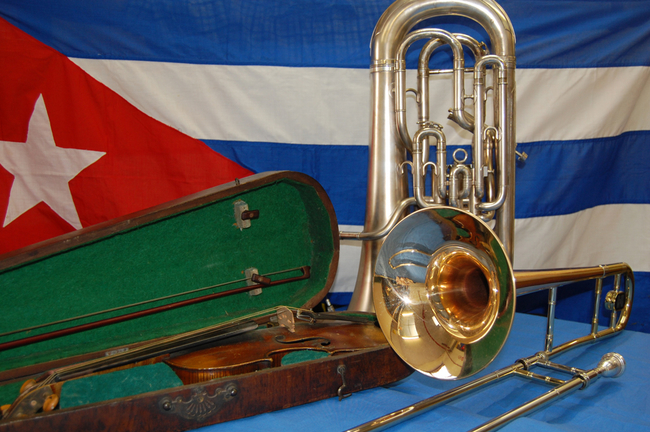 You can support Play for Cuba by collecting and donating instruments. You can also sponsor and fundraise to pay for instruments and transport costs; set up a regional hub to act as a collection point; and publicise the appeal in your local communities. It’s surprising how many instruments are gathering dust in attics, garages, and stock rooms. Skilled craftspeople and musicians in Cuba are waiting to repair and breathe new life and tunes into these. We are appealing for all new and second-hand instruments, plus reeds, strings and drum sticks, and any associated items such as carrying cases or music stands. We also need donations and fundraising to pay for the transport of instruments from regional collection hubs to the main container and shipping to Cuba. Play for Cuba was launched at National Education Union (NUT Section Conference) in 2018. It runs for 12 months until April 2019 when we aim to make the final nationwide collection and wave the container off from the NEU conference in Liverpool. Find out how to get involved by contacting info@playforcuba.org or call 0207 490 5715.